Antoni Llueca, Jose Luis Herraiz, Dolors Piquer, Yasmine Maazouzzi and Enrique Calpe Gómez. The aim of this work is to evaluate the safety and efficacy of the barbed unidirectional suture in a total laparoscopic hysterectomy. 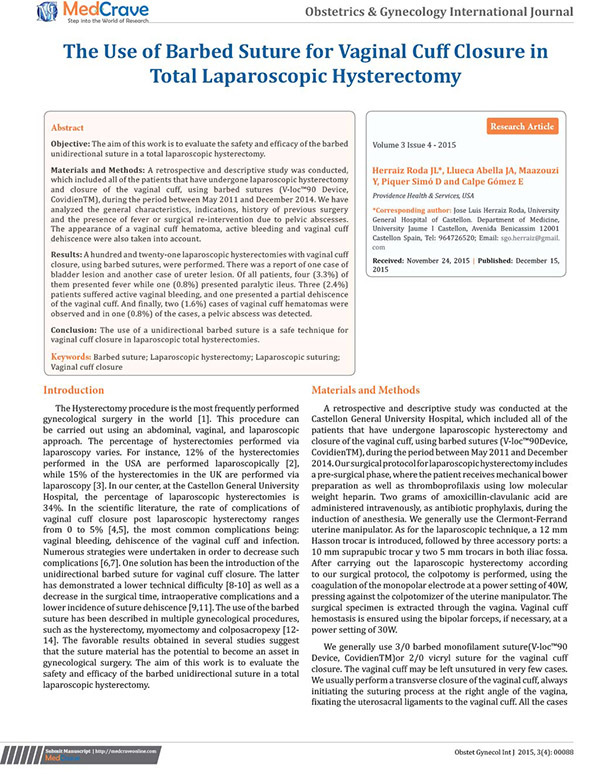 A retrospective and descriptive study was conducted, which included all of the patients that have undergone laparoscopic hysterectomy and closure of the vaginal cuff, using barbed sutures (V-locTM90 Device, CovidienTM), during the period between May 2011 and December 2014. We have analyzed the general characteristics, indications, history of previous surgery and the presence of fever or surgical re-intervention due to pelvic abscesses. The appearance of a vaginal cuff hematoma, active bleeding and vaginal cuff dehiscence were also taken into account. A hundred and twenty-one laparoscopic hysterectomies with vaginal cuff closure, using barbed sutures, were performed. There was a report of one case of bladder lesion and another case of ureter lesion. Of all patients, four (3.3%) of them presented fever while one (0.8%) presented paralytic ileus. Three (2.4%) patients suffered active vaginal bleeding, and one presented a partial dehiscence of the vaginal cuff. And finally, two (1.6%) cases of vaginal cuff hematomas were observed and in one (0.8%) of the cases, a pelvic abscess was detected. The use of a unidirectional barbed suture is a safe technique for vaginal cuff closure in laparoscopic total hysterectomies.